One meal that my boys request the most is spaghetti. They love it. Over the years I have found different ways to make spaghetti other than the traditional way most of us know. Have you ever made it in the oven made it creamy? 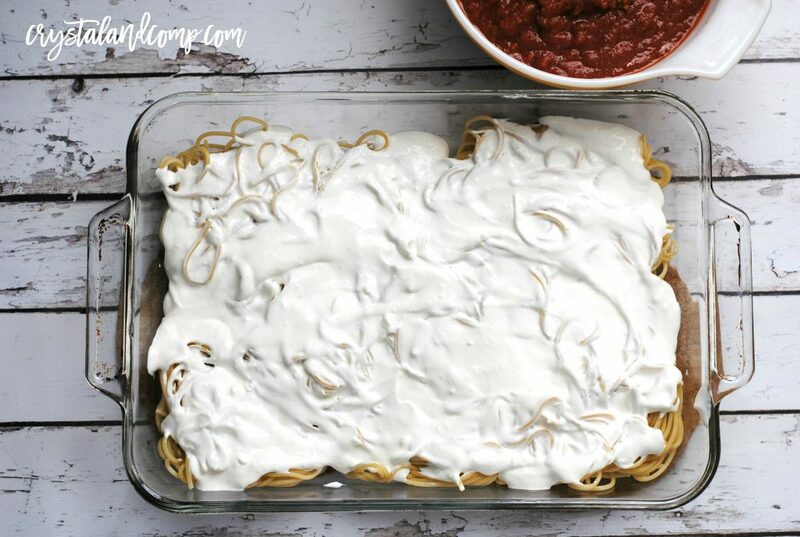 Let me show you how we make this baked spaghetti with sour cream. It’s a casserole. 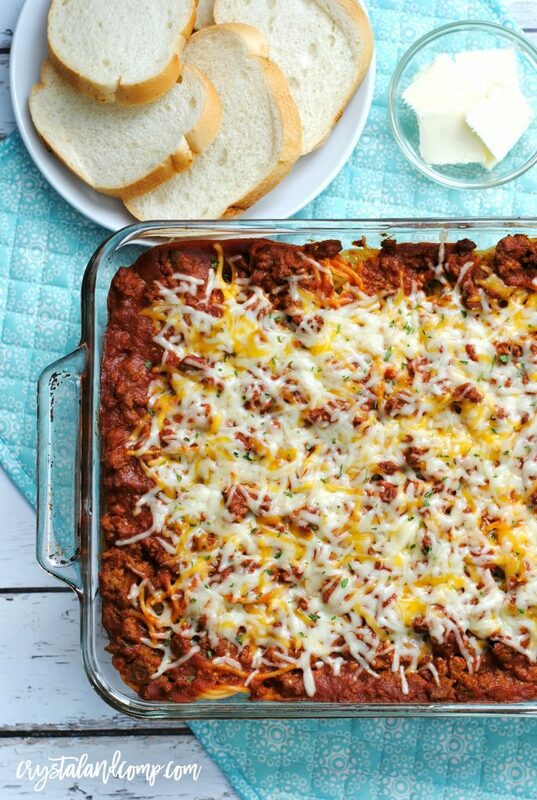 It is perfect for a weeknight dinner, for a church potluck or when you’re hosting a crowd. We love it and it is so easy to make. Here is how we make it. Brown your ground beef and garlic. You know how much we love garlic around here! Drain the grease and add back to the pot and stir in the jar of spaghetti sauce. Boil your spaghetti noodles until firm but not fully cooked. Mix cream cheese, sour cream and cottage cheese in a medium bowl until blended. Slice half a stick of butter and place in the bottom of a 9×13 pan. Layer half of spaghetti noodles on top of butter. Spread cream cheese mixture over the top of the noodles and then top with remaining noodles. Slice remaining butter and put on top of noodles. 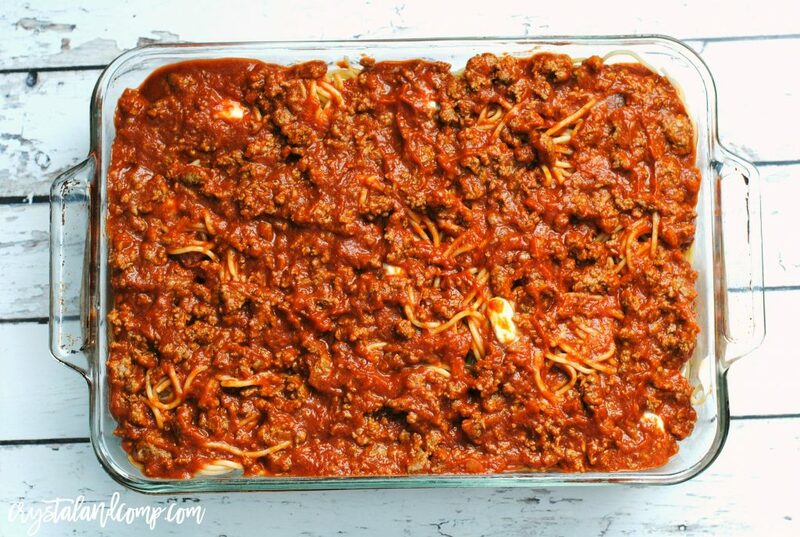 Spread meat sauce over the noodles and bake for 30 minutes. Sprinkle shredded cheese on top and bake 5-10 minutes or until cheese is melted. Sprinkle with parsley and serve with your favorite bread and butter. This is amazing and I promise rave reviews for everyone in the house. It’s a great change from traditional spaghetti and my husband who hates sour cream does not even notice sour cream is in it. 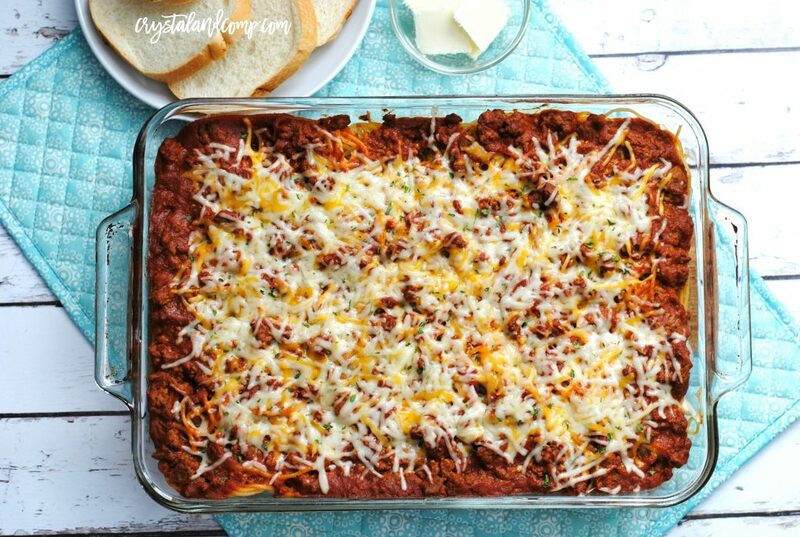 This spaghetti casserole is a crowd pleaser! Preheat your oven to 350°.Brown your ground beef and garlic. 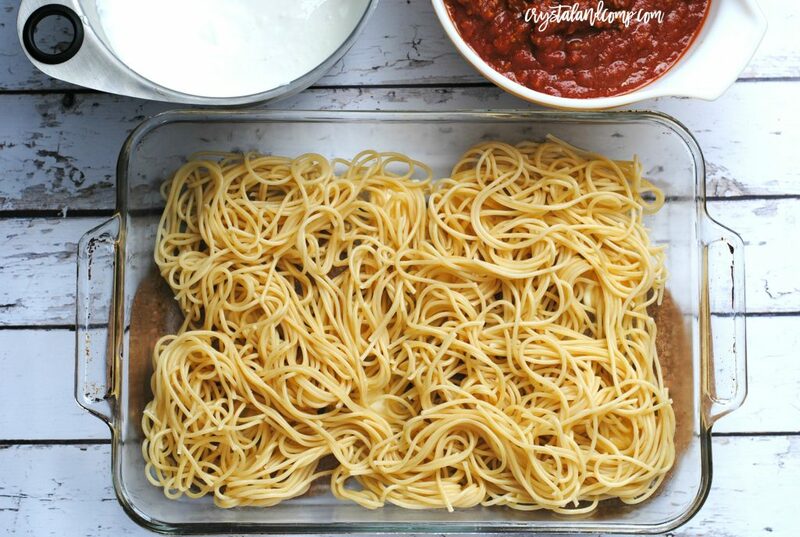 Drain the grease and add back to the pot and stir in the jar of spaghetti sauce.Set it aside.Boil your spaghetti noodles until firm but not fully cooked.Drain them and set them aside. Mix cream cheese, sour cream and cottage cheese in a medium bowl until blended.Set it aside.Slice half a stick of butter and place in the bottom of a 9×13 pan.Layer half of spaghetti noodles on top of butter.Spread cream cheese mixture over the top of the noodles and then top with remaining noodles.Slice remaining butter and put on top of noodles.Spread meat sauce over the noodles and bake for 30 minutes.Sprinkle shredded cheese on top and bake 5-10 minutes or until cheese is melted.Sprinkle with parsley and serve with your favorite bread and butter. This recipe looks sooooo delicious! 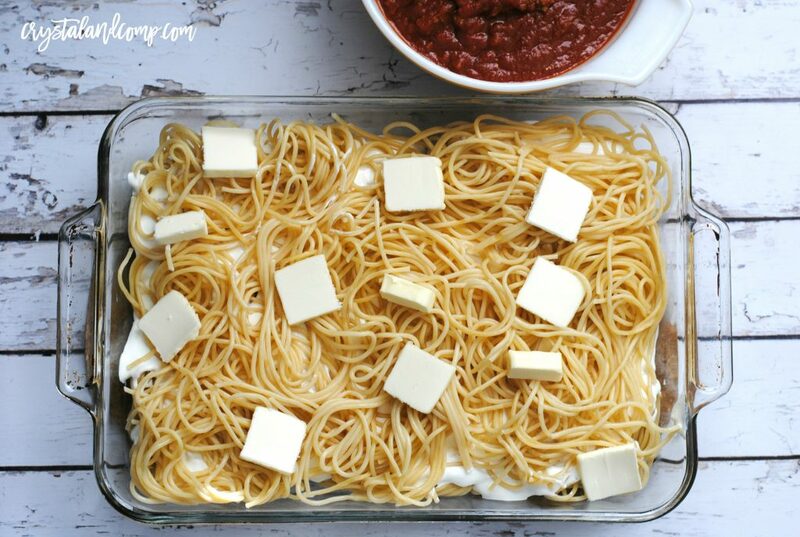 I’m a spaghetti lover and would love to try this recipe out! I have never baked a spaghetti recipe in the oven myself. I’m going to pin this recipe! Thank you for this great recipe! It’s a nice change to our standard kid-friendly dinner repertoire. My family absolutely loves this easy recipe. The casserole is so creamy and filled with flavor. Thank you for a winning recipe! Oh, Crystal! This is a winner. I never make spaghetti because you have to stand by the pot and babysit the pasta. This is going on my weekly menu!